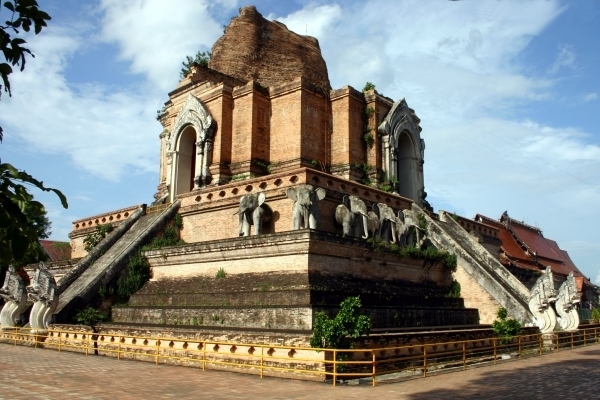 In its day, Wat Chedi Luang must have been the most impressive temple in Chiang Mai. Built about 600 years ago, the huge chedi which gave the temple its name (the name of the temple translates to "royal pagoda") must have soared high above the surrounding city. I say "must have" because the chedi was mostly destroyed within a few hundred years of its construction. Some say it was an earthquake in the seventeenth century that did the deed; others say it was King Taksin's cannons firing on the city to chase out the Burmese in the eighteenth century. The pagoda has been partially reconstructed, but the spire has not been recreated since nobody can be sure what it looked like. Reproduction of the Emerald Buddha in the Eastern niche of the chedi. 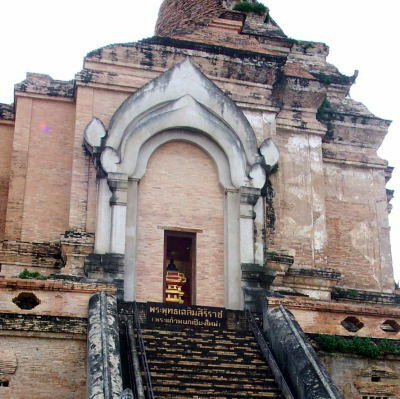 Wat Chedi Luang was also important because for a short time it housed the most important object in Thailand, the Emerald Buddha. The Emerald Buddha is now in its own temple in Bangkok, but a few years ago the king donated a replica to be placed in the eastern niche of the chedi. The other niches are occupied by stone Buddha images. On the southern side, the base is decorated with elephant statues. To the west of the pagoda is a small open shed housing a reclining Buddha image. There are often artists offering their wares in stalls on the large plaza of the chedi. 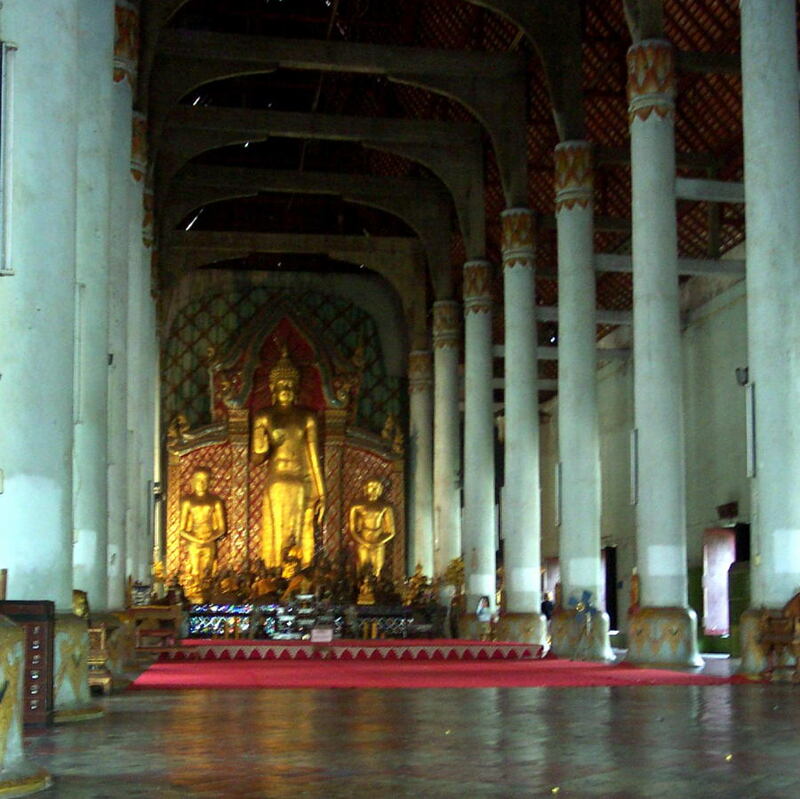 Inside the main prayer hall, the altar is backed by a magnificent standing Buddha. Round whitewashed columns support an unfinished wood roof. However, the hall was in the middle of a "radical makeover" in August 2007, so the view may change soon. Altar in the main sala. Also inside the grounds of Wat Chedi Luang is the lak muang, the guardian spirit post (city pillar) of the city. Wish you could have this information with you when you visit Chiang Mai? Now you can. Check out our ebook guides. 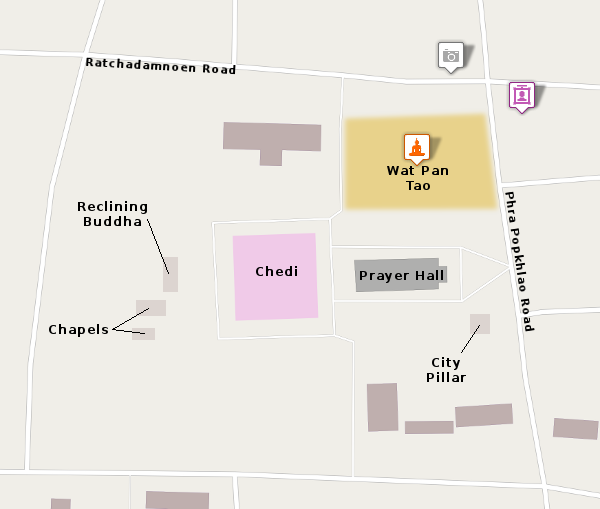 Wat Chedi Luang is on Prapokklao Road which runs roughly through the north-south center line of the old city, from Changpuak Gate to Chaing Mai Gate. The temple is just a short walk south of the intersection with the main east-west Ratchadamnoen Road.